We are dealing with SONOTEC - ULTRASONIC SOLUTIONS, and involved in specialize ultrasonic leak measuring solutions . 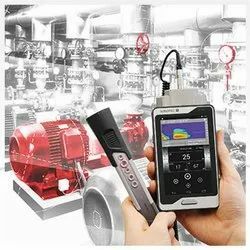 With the World's most advanced and sensitive SONAPHONE you can find and classify leaks in compressed air, gas and vacuum systems, analyze the condition of your machines and systems, detect partial discharges and check the function of steam traps and valves. The mobile handheld device is operated with a touch screen like a tablet and is the ideal companion throughout the entire test procedure. Besides test values and spectrograms, it is also possible to store photographs, voice memos and comments relating to the measuring points. With only a few clicks, you receive a test report and can prove to management your contribution to energy efficiency and process optimization. In the age of Industry 4.0 the optimizing processes, increasing operational safety, and improving energy efficiency are becoming more and more significant. Meet the challenges of Maintenance 4.0 with the new SONAPHONE from SONOTEC. The digital ultrasonic testing device combines innovative sensors and software for preventive maintenance that can be operated intuitively and paves the way for new processes for new applications. The SONAPHONE T mobile ultrasonic transmitter is designed for the rapid and reliable detection of seal failures in windows, doors, cabins, vehicles and containers with sealing surfaces or rubber profile seals. In addition to applications in road and rail vehicle construction, the SONAPHONE T is also used in the ship and boat building industry and for testing fire safety doors, climatic chambers and clean rooms. 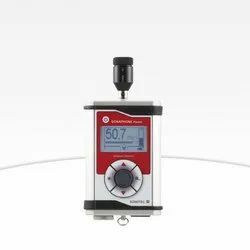 Used in conjunction with an ultrasonic receiver from the SONAPHONE series, the SONAPHONE T enables efficient leak testing at minimal cost. Due to the simple operating principle, use of the device does not require a great deal of costly staff training and therefore minimizes post-purchase costs. The robust ultrasonic transmitter has an integrated LC-display for simple menu navigation. The modulation of the transmission signal guarantees the clear detection of the ultrasound signal, irrespective of potential background noise. Furthermore, the sound intensity of the transmitter is also adjustable. This means that the device is capable of precisely detecting the smallest of leaks as well as large areas of leakage. The option of using the additional unidirectional spherical transmitter SONOSPHERE enables the testing of both very large and awkwardly-shaped areas. 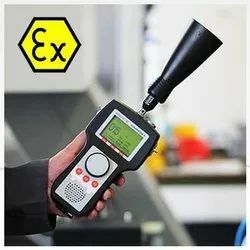 The SONAPHONE E is designed for the rapid, reliable and cost-effective detection of seal failures and the smallest of leaks within compressed air systems and networks, vacuum systems, industrial equipment and machinery and covered pipes with restricted access. 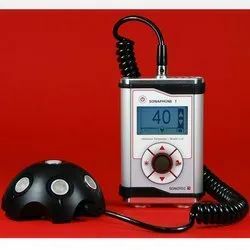 The ultrasonic detection device enables the early detection and avoidance of potential damages and resulting cost savings. The regular inspection of engines, pumps and gearing using the SONAPHONE E leads to increased operational reliability and guarantees a higher degree of availability of machinery. By means of the flow noise the inspection of the leak tightness of valves, slide valves and steam traps is possible. The option of an additional ultrasonic transmitter allows the control of the leak tightness of windows, doors, cabins and devices with little additional expense. Defect induced noises and wear to various machinery components and rotating machinery can be recorded electronically. In addition to all individual and serial testing procedures, all irregularities can be transferred to a PC online and presented and archived in graphic and tabular format. An efficient integrated data logger enables the rapid transfer of data between the device and your computer via a USB interface. The addition of an optional temperature sensor allows the measurement and simultaneous recording of surface temperatures of up to 800 °C. The SONAPHONE E has a user-friendly display and PC software with logical menu navigation.